Finance for $704 per month at 3.99% APR for 72 months with $5,167 down payment. Payment expires on 04/30/19. Estimated Finance payment based upon 3.99% APR for 72 months, with a down payment of $5,167. Excludes title, taxes, registration, and license fees. Some customers will not qualify. See your authorized dealer for complete details on this and other offers. Residency restrictions may apply. Lease for $484/month for 36 months with $5,167 due at signing including $0 Security Deposit and 10,000 miles per year. Payment expires on 04/30/19. Estimated Lease payment based on 36 months and $5,167 due at lease signing. Cash due at signing includes $7,183 capitalization cost reduction, which includes $795 acquisition fee, plus a required security deposit of $0, and first month's lease payment of $484. Excludes title, taxes, registration, and license fees. Total monthly payments equal $24,596. Mileage charge of $0.25 per mile over 10,000 miles. Not all consumers will qualify. Residency restrictions may apply. Navigation, Heated/Cooled Seats, Moonroof, 10.2" HEAD-UP DISPLAY (HUD), iPod/MP3 Input, F SPORT PACKAGE. ATOMIC SILVER exterior and BLACK W/ HADORI ALUMINUM interior, ES 350 F SPORT trim. EPA 31 MPG Hwy/22 MPG City! CLICK ME! RADIO: NAVIGATION W/MARK LEVINSON AUDIO premium surround sound system, 17 speakers and 12.3-inch display, Electrochromatic Rearview Mirror, TRIPLE BEAM LED HEADLAMPS, BLIND SPOT MONITOR W/PARK ASSIST Lane Change Assist, Intelligence Clearance Sonar, Rear Cross Traffic Auto Brake (RCTAB), 10.2" HEAD-UP DISPLAY (HUD), ACCESSORY PACKAGE 2 Cargo Net, Carpet Trunk Mat, Rear Bumper Applique, Key Gloves, Alloy Wheel Locks, F SPORT HEATED LEATHER STEERING WHEEL windshield deicer, F SPORT PACKAGE Front & Rear Performance Dampers, Hadori Aluminum Interior Trim, F SPORT Shift Lever & Knob, F SPORT Gauges w/Movable Display Ring, Rear Spoiler, Active Noise Control, F SPORT Pedals, 8" TFT LCD Instrument Panel Display Thin Film Transistor, F SPORT Grille w/Dark Surround, F SPORT Analog Clock. Lexus ES 350 F SPORT with ATOMIC SILVER exterior and BLACK W/ HADORI ALUMINUM interior features a V6 Cylinder Engine with 302 HP at 6600 RPM*. At Lexus Santa Monica in Santa Monica, we have the new and used vehicles you have been looking for! 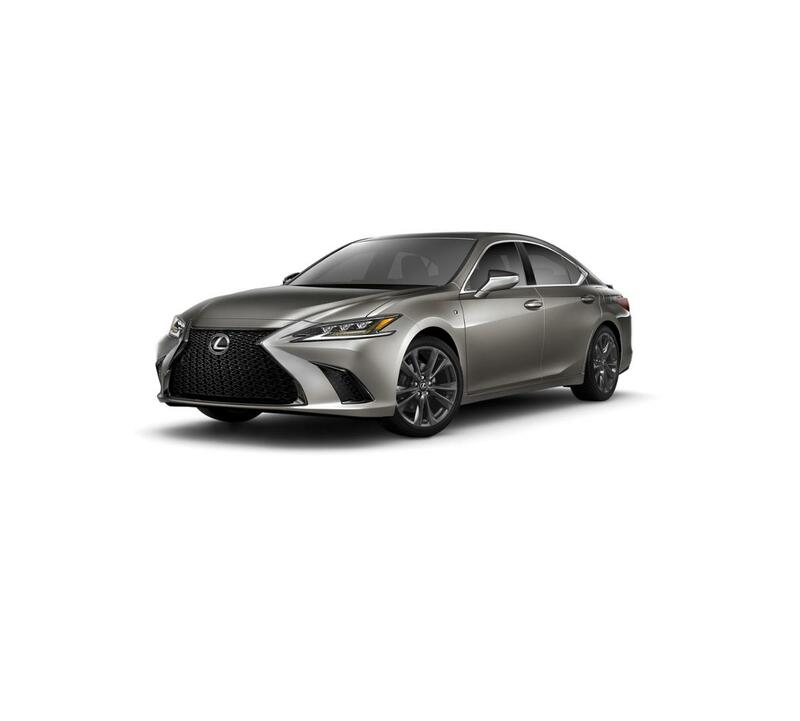 This Atomic Silver 2019 Lexus ES 350 F SPORT, is available right now at your Santa Monica Lexus dealership. Call us at (424) 229-9998 if you have any questions about this Lexus or any of the other vehicles at our Santa Monica Lexus car dealership.